Specially made for 500x5 narrow width wheels. Available in solid or hollow center light weight version. Requires two spacers. 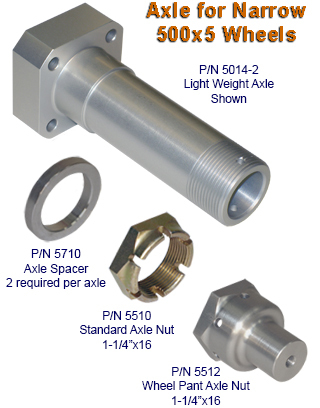 Part Number 5710 per axle. For use with 50-3, 51-3, 56-3 and 57-3 500x5 wheels. Static Load Rating: 1,250 lbs. Static Load Rating: 700 lbs.